Continuing yesterday’s theme–here is an iconic tree of the Pacific Northwest. Western Hemock (Tsuga heterophylla) is a tall, straight-trunked tree that can be identified at a distance by the way its tip droops sideways rather than standing upright. Up close, look for short, round-tipped needles of irregular length (5 to 20 m) that splay out from the twig in several directions. Ain’t it adorable!! 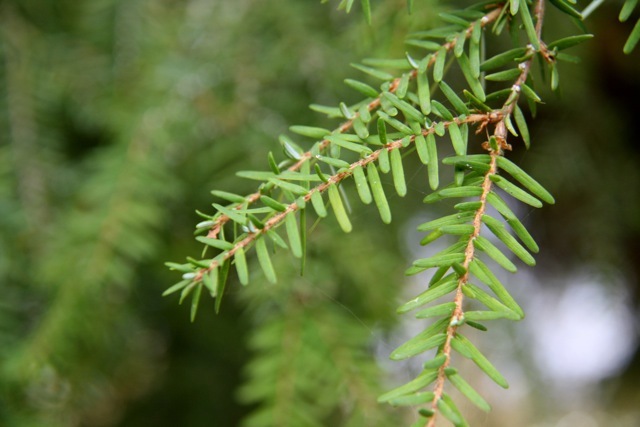 Western Hemlock was used extensively by the northwestern tribes–for medicine and lots of other stuff besides. For example, you can make a black dye by steeping its bark in urine (left on its own, the bark can make a red dye). It can also be used to tan hides. Wood was carved into paddles, spits, spearshafts and more. Dancers in one tribe made much of their outfits from the boughs. This tree also forms the densest canopy of any tree in the west, according to Plants of the Pacific Northwest Coast. As a result, not many other plants grow underneath–I saw this recently near Arcata, where nothing grew in the understory except a few patches of false Solomon’s seal. Sadly (luckily?) you’ll have to travel to see a wild specimen of this tree–the only places it grows in California are Humboldt and Del Norte counties (and possibly Trinity). Western hemlock can be seen in Mendocino County at Russian Beach State Park campground!